Let us take care of all your WordPress Support and Maintenance with our first class wordpress maintenance service and support plans. Our services include content updates, security, optimisation, backups and all the other things you haven’t got time to worry about! WordPress maintenance has a key part to play in the day to day running of a successful wordpress driven business. So when you choose one of our WordPress Maintenance Services, you can relax knowing your site content will be kept fresh, WordPress will be kept up-to-date and you will have wordpress support you can rely on, so you’ll have more time to focus on things like growing your business. Imagine the benefits of your very own expert WordPress Manager. Whether you are looking to keep your site secure, are looking for enhanced WordPress maintenance services, or want grow your business and improve your visibility, we can help you. All of our managers have years of WordPress Support, maintenance and development experience. Our team have built hundreds of WordPress websites, WooCommerce stores, responsive websites, plugins and applications. We know WordPress inside out. WordPress is the platform that we’ve always specialised in. Why? because it’s constantly evolving and is highly customisable. The majority of businesses and site owners don’t have the technical knowledge or time to make sure their WordPress site is updated, secure and actually performing at it’s best. That’s where we come in. We’re on a mission to re-define WordPress support for our customers. 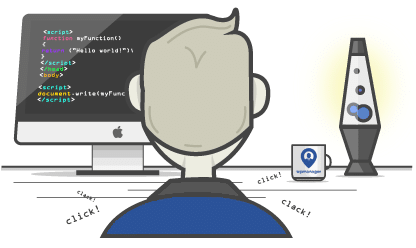 As a small team of WordPress developers, based in the UK, you’ll always be working with someone who really knows your business (no outsourcing or sub-contractors here). WP Manager only take on a certain amount of customers per year. We focus on providing the highest level of WordPress support, optimisation and maintenance. Your business isn’t 9-5, so you need support that can truly provide for you. Benefit from 24hr support Monday – Thursday. At WP Manager, we do things differently. Each month, you’re getting real, tangible value from our professional team. Working in partnership with you, we’ll help you identify areas on your site that can be further optimised or improved. We actively manage and optimise your website – keeping plugins and WordPress up to date, improving performance, adding content, supercharging your SEO. We also provide extra daily backups on our WordPress Maintenance plans, aswell as making backups before any updates. So if you run into trouble with backups from your host, we’re available to save the day. What more could you want from a wordpress maintenance service? 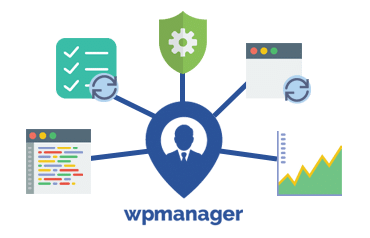 How can WP Manager help you? Save time, save money, reduce stress. Secure your site against hackers with pro-active security and 24/7 monitoring. 24/7 monitoring of site performance, security, uptime, SEO and more! Our friendly, UK based expert maintenance services allow you to achieve peace of mind. Join the WP Manager affiliate scheme. Quick - cost free setup. For each referral you'll earn a generous 50% commission. Spread the word. We also offer white-label too. Choose a service plan below and let our friendly team protect and optimise your WordPress site. Monthly WordPress Maintenance Plans. Let us optimise and grow your website, while you focus on your business. FREE litespeed caching optimised for WordPress & WooCommerce websites is included for members. But it's totally optional. We'll work with your current host or add you to our litespeed hosting servers. Need some changes made? Order a WordPress tweaks package. Perfect for when you need some tweaks or fixes to your website made. No outsourcing. Just friendly, UK based expert help when you need it. 24/7 support system. 24 hour live support from Monday - Thursday. WP Manager ensures your website is fast, fully optimised and secure.